The Cork Mother Jones Committee is privileged to welcome Betty Cook and Anne Scargill to Cork. Betty Cook was born in 1938 in Doncaster. Having trained as a nurse, Betty married and raised her family of three children and watched from home as the coal strikes of 1972 to 1974 took place. She was determined not to look on from the sidelines when the next strike began. 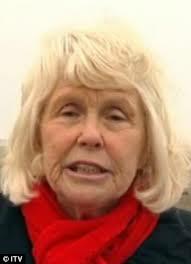 Anne was born in 1941, in 1961 she married Arthur Scargill and they have one daughter. She has worked at the local Co-operative Retail Society all her life. The Miners’ Strike and its aftermath was a life changing experience for both. In March 1984, the National Coal Board announced that it was going to close 20 coal mines with the loss of almost 20,000 mining jobs. The leader of the National Union of Mineworkers, Arthur Scargill claimed this was part of a master plan by the Thatcher government to close many more pits and destroy the Mineworkers Union. (The release of the British Cabinet papers reported in the BBC earlier this year demonstrates that he was correct as there were secret plans to close 75 pits over 3 years with the loss of 64,000 jobs). Sporadic strikes broke out immediately and by the 12th March, Arthur Scargill had declared a national strike. Betty and Anne were founder members of the Barnsley Miners Wives Action Group. They became key members of the community support groups which eventually led to the formation of Woman against Pit Closures in Barnsley. Betty and Anne Scargill had become friends and both were instrumental in the formation of Women Against Pit Closures. WAPC played a major role in the period of the strike and has remained active to the present day. Many women including Betty and Anne initially organised the community kitchens, which fed whole communities during the strike. Soon they took on a more active role in the strike and joined in the pickets and protests and marches. In August 1984, over 20,000 women marched in support of the strike in London. Out of this activism emerged a new movement which brought together and empowered working class woman from mining communities all over the country and which has survived the closure of the pits. Following the miners defeat, life was never the same for many of the women activists as they had experienced a new sense of individual freedom, of personal strength and had found their voices as they addressed packed meetings up and down the country during the strike. Betty and Anne have campaigned actively over many years. They attended the World Social Forum in Mumbai and were shocked at the poverty they witnessed when they walked the streets. During a renewed wave of pit closures in 1993 they helped with the pit camps, most notably Grimethorpe which were organized along the lines of the Greenham Womens Peace camp. Anne spent 5 days underground as part of a protest in 1993 at the Parkside Colliery in Lancashire. They have campaigned in support of the Wapping print workers. Both helped provide work wear for miners’, medicines and toiletries for Cuban miners and their trip to Cuba became the subject of a Channel 4 documentary. In 2012, a new banner from the Woman against Pit Closures featured in the Durham Miners Gala, accompanied by Betty Cook and Anne Scargill. In Cork, Betty and Anne will discuss their experiences of 1984 and 1985 and the impact on their local communities at the festival, they will give their recollections of an event that changed the face of Britain and changed them also forever. The British Miners’ strike and its aftermath may yet prove to have been a watershed moment in the history of British trade unionism, organised labour and the solidarity of the working class. All are welcome.